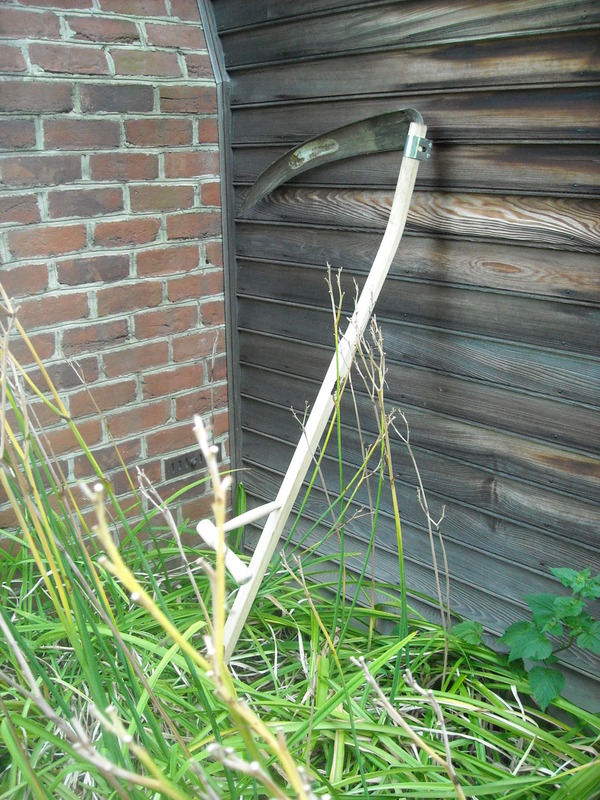 Choosing to buy a scythe is a rather radical choice in this land of Stihl and Deere yet it may be an appropriate choice for this small property. Beyond the reach of our farmer's haymaking equipment and electric fencing lines, pasture grass grows too tall for the lawn mower and string trimmer. We have avoided purchasing a brush hog because the benefit does not balance the cost, especially since we do not have a tractor to pull a heavy mower. Until now I have donned safety glasses, ear plugs, boots and gloves to run the weed trimmer along the bottom of the fence lines. I have also gratefully borrowed a friend's heavy trimmer with harness and blade to attack the weediest lines. This hand numbing, ear ringing task is one of my least favorite jobs on the farm and I often avoid it until the electricity is being sapped from the fence enegizer. In order to keep our aged string trimmer running well I need to learn small engine repair but I do not know if that is how I want to spend my limited farm time. Purchasing and using a scythe postpones small engine repair lessons and lessens my dread of fencerow clearing. My mornings of clearing the fencelines have been quiet with no strident motor to compete with farm sounds. Yes, the scythe has worked different muscles but the light blade does not strain my back and periodic honing of the blade gives me a chance to stretch and reposition. Removed from the mad dash to get as far along the fence perimeter as possible before the gas or string runs out, I have been able to check the hi tensile line, watching for areas that need tightening, and observe the sheep and cows in the field. I have not attempted to clear a swath of grass on a bit of field, the fencerow clearing has been more pressing. Hopefully at some point I will mow with a rhythmic motion and the blade will whisper.